The IWR1642 device is an integrated single-chip mmWave sensor based on FMCW radar technology capable of operation in the 76- to 81-GHz band with up to 4 GHz continuous chirp. 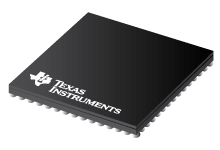 The device is built with TI’s low-power 45-nm RFCMOS process, and this solution enables unprecedented levels of integration in an extremely small form factor. The IWR1642 is an ideal solution for low-power, self-monitored, ultra-accurate radar systems in industrial applications such as building automation, factory automation, drones, material handling, traffic monitoring, and surveillance. The IWR1642 device is a self-contained, single-chip solution that simplifies the implementation of mmWave sensors in the band of 76 to 81 GHz. IWR1642 includes a monolithic implementation of a 2TX, 4RX system with built-in PLL and A2D converters. The IWR1642 also integrates a DSP subsystem, which contains TIs high-performance C674x DSP for the radar signal processing. The device includes an ARM R4F-based processor subsystem, which is responsible for front-end configuration, control, and calibration. Simple programming model changes can enable a wide variety of sensor implementation with the possibility of dynamic reconfiguration for implementing a multimode sensor. Additionally, the device is provided as a complete platform solution including reference hardware design, software drivers, sample configurations, API guide, training, and user documentation.